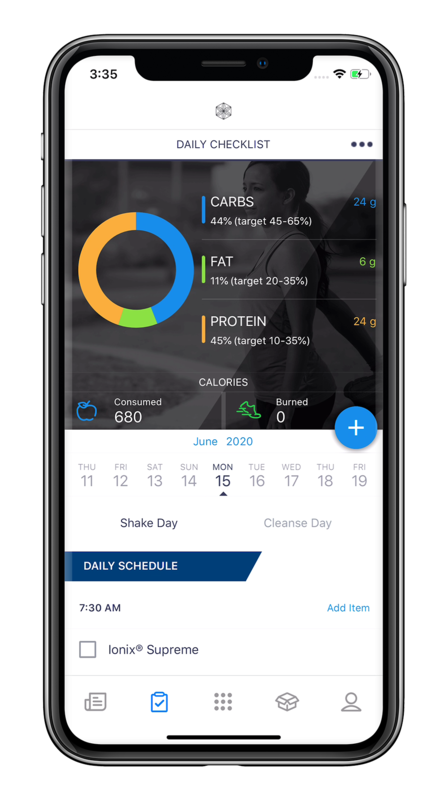 Stay on the right track with your Weight Wellness Program with this convenient nutrition and fitness tracker, personal coach, and product-ordering platform in one easy-to-navigate app! Fully integrated Isagenix Product Catalogue. Search and import popular meals, restaurant chains, and popular brands to more accurately track nutrition consumption. Set and adjust your Autoship so you never miss a day of your system. Connect with your Enrolling Sponsor and anyone who joins Isagenix through you! Share and receive tips, support, recipes, and more on your Activity Feed. Discover how your team members are doing on their journey towards their goals. As an Associate, you can now share Isagenix with potential Customers with one click inside the IsaLife™ app! In less than two minutes, your potential Customer can create their Isagenix account and both their initial order and Autoship, as recommended by you! Customers and Associates can download IsaLife™ for free from the Google Play or Apple App stores in Australia, New Zealand, the United States, Canada, Puerto Rico, , United Kingdom, Belgium, Spain, Ireland, and the Netherlands. Which mobile devices support the IsaLife™ mobile app? IsaLife™ is available for iPhone (iOS version 10.2 and above, iPhone 5s or newer) and Android (version 6.0 ’Marshmallow’ and above) devices. The app is not supported using Blackberry, Windows Phone, or Kindle Fire. IsaLife™ uses the same username and password to access your existing Isagenix account. To recover your username, contact your local Customer Care team. To reset your password, visit the Back Office login page and select the ’Forgot your password’? link. Do I still need IsaPulse and IsaTools? Isagenix provides product and health-related content to everyone’s Activity Feed. We encourage users to share other activity, progress, badges, and support through the Activity Feed to help inspire their Personally-Enrolled team members reach their goals. When posting to your Activity Feed, you have the option to share with your 1PET, your Coach, or both. Comments added to a post from Isagenix are viewable by all IsaLife™ users regardless of team placement. Can I share Activity Feed posts outside of IsaLife™? Absolutely! Tapping the ’Share’ button below the post allows users to share content via text, email, or through various social media platforms. Can I share videos from IsaTools to IsaLife™? While IsaLife™ allows you to share videos in your Activity Feed from sites like YouTube or ANZ.IsaMovie.com, we recommend sharing content from IsaTools directly from that mobile app to ensure you receive all the analytics that come with your subscription. Which programs are available in IsaLife™? Users can currently enrol in the Weight Wellness Program by tapping on the Daily Checklist icon. Isagenix is working to release additional programs soon. Tap the Daily Schedule icon, and then tap the ’Click here to start one’ link. Next, select from the list of Available Programs and then the ’Enrol in This Program’ button. IsaLife™ will prompt you for some additional information to complete the process. Can I use a program if I’m not using a system, pack, or another program? Yes! IsaLife™ is a customisable tool that allows you to integrate your favourite Isagenix products into your routine. For additional information on how to customise a program, see the Daily Checklist section. Your photos, weight goals, and measurements are only visible to you inside of the IsaLife™ app. Access the Daily Checklist and tap on the three dots in the upper-right corner. Next, select ’Program Information’ from the slide up drawer. Scroll down on the next page and select the ’Resign Program’ button and then confirm. No. For your convenience, the Daily Checklist includes Isagenix products and reminders on when to have a snack (up to 200 calories) or meal (400-600 calories). Checking the preloaded items like IsaLean® Shake or Ionix® Supreme will automatically update your macros; however, we recommend adding your snack and meal items to ensure your daily macros and consumed calories are accurate. Select the “’Add Item’ link to browse additional food or Isagenix products. Once you locate an item, make any necessary adjustments to the serving size or amount, then select the ’Add to Checklist’ button. To remove an item from your Daily Checklist, swipe left and select the ’Delete’ button. You can remove both manually entered items as well as preloaded products. We realise that some days you may get busy and not complete your Daily Checklist. IsaLife™ allows you to enter food and activities for the previous day. 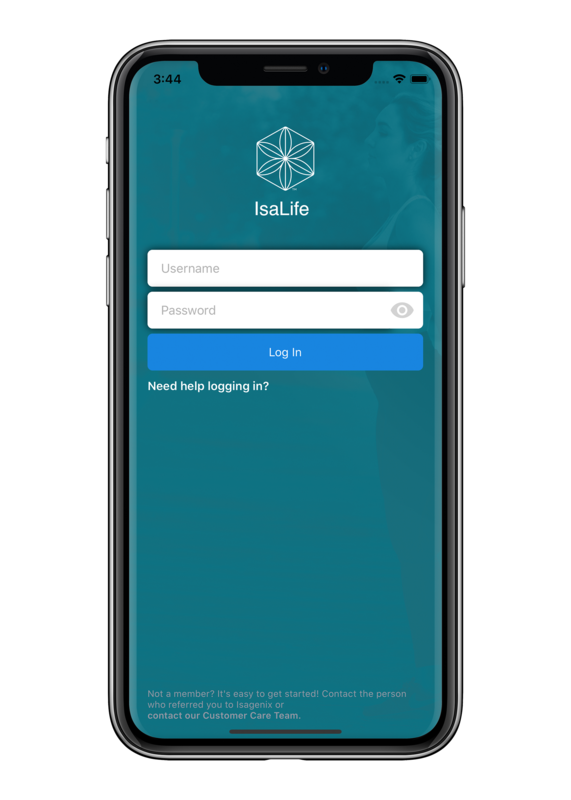 IsaLife™ users can sync with Fitbit or Apple Health, which will automatically import their fitness activities to the Daily Checklist. First, access the ‘Settings’ tab in IsaLife™, then scroll down and tap ’Settings’. Next, tap on ‘Fitness Trackers’ to choose which device you would like to connect with. Yes. When selecting a program, IsaLife™ will prompt you to choose your Shake and Cleanse Days; however, you can change them at any time by selecting the Shake Day or Cleanse Day tab on the current day’s date. IsaLife™ will prompt you to confirm the switch. Please keep in mind any journal data already entered for that day will be lost. Tap on the Shopping (box) icon and use the search feature or product categories on the One-Time Order tab to locate your favorite Isagenix products. Tap on the image and configure your preferences, then select “Add to Cart.” Once you’re done choosing products, select the shopping cart icon in the upper-right corner to proceed to checkout. How do I manage my Autoship in IsaLife™? Tap on the ‘Shopping’ (box) icon and select the ‘Manage Autoship’ tab. From here you can update the next shipping date or frequency or update the products for your next order. IsaLife™ uses information from your existing Isagenix account. To add a new payment method or address, log-in to your password-protected Back Office. If you have the payment or address already saved to your account, you can select it when completing your Wholesale or Autoship order. While in the shopping cart for Wholesale or Autoship orders, select the pencil icon to edit the packaging or quantity or the rubbish bin icon to remove it from your shopping cart. On the checkout page, select the ’Add Member Coupons’ link to view and apply coupons saved to your account. You can also manually enter a coupon code in the ’Use a Coupon’ field to apply a discount to your Wholesale or Autoship orders. Which countries can enrol using IsaLife™? Associates in Australia, New Zealand, the United States, Puerto Rico, and Canada can share Recommended Carts with potential Customers via IsaLife™ to complete their enrolment. We anticipate expanding to additional markets in 2019. You can create up to 20 Recommended Carts by logging into your password-protected Back Office and selecting ’Manage My Recommended Carts’ from the ‘Teams’ tab. Select the ’Create New Recommended Cart’ button, choose the country and level of savings, then configure the initial order and Autoship products. Provide a name for your Recommended Cart and select the ’Save’ button. Your Recommended Cart is now ready to share via the IsaLife™ app! If your initial order includes a qualifying system or pack, you’re eligible to earn a Product Introduction Bonus when your potential Customer enrols using that Recommended Cart! Is Autoship required when creating a Recommended Cart? Autoship is required when creating a Recommended Cart; however, your potential Customer can remove it during their enrolment process. Tap the Setting icon in IsaLife™ and select the ’Share Isagenix’ tab. 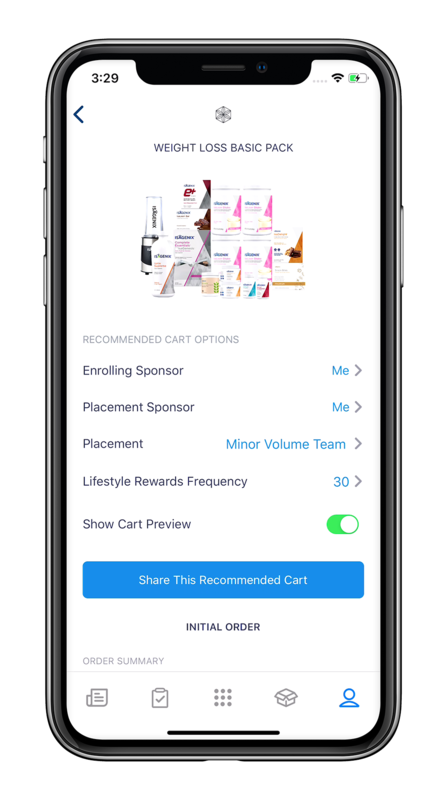 Select the Recommended Cart you want to share with your potential Customer, review and edit the placement options as needed, and then tap the ’Share This Recommended Cart’ button to send a link to your potential Customer via text, email, WhatsApp, Facebook Messenger and more. Does my potential Customer need IsaLife™ to enrol? No. Your potential Customer will view the Recommended Cart sent to them on a mobile-responsive website. After entering some basic information to get started, they will review their products and complete their billing and shipping information to create their Isagenix account. If they complete the process using PayPal, their personal details are automatically synced making the process faster and easier! Potential Customers can stop at any point during their enrolment process and come back later to finish without losing their progress. Their sessions will expire after 48 hours have passed since their last action. After 48 hours, they will need to begin the enrolment process again. How do I track my potential Customer’s progress? IsaLife™ will send you notifications when your potential Customer begins and completes the enrolment process. You can also track each step by accessing the ‘Settings’ tab and select ’My Prospects’ in the IsaLife™ app. Locate and tap on your potential Customer’s name to view where they are in the enrolment process, as well as any changes they’ve made to their initial order and Autoship. This customised view allows you to reach out to your new Customer to provide additional support and guidance. You: I’m going to send you a text later today with information about downloading the IsaLife™ app. It’s going to make using your system so fun and easier for you to follow! You: I’m so excited for you to get started! If you haven’t yet, be sure to download the free IsaLife™ app from the Apple App Store or Google Play Store. Your first step will be clicking on the calendar icon to set up your Weight Wellness program. It’s easy – just follow the prompts! Before your system arrives, make sure to watch the brief videos included in the app about how to do Cleanse and Shake Days, and the Product Overview. Once you’ve done all of that, shoot me a text! You: Awesome! The app is so user friendly and I know you’re going to love it. Another cool feature is that you can order more products and manage your monthly order through the app. It’s amazing how Isagenix makes the ordering process so simple and convenient! Talk to you soon! How can I utilise IsaLife™ to connect with my team? IsaLife™ is the perfect platform to help you connect with your Personally-Enrolled team, especially while on-the-go. The app allows you to share tips and support through the Activity Feed and allows your Customers to reach out to you directly and share their experience. As an Enrolling Sponsor/Coach, IsaLife™ provides you with priority notifications so you know exactly when to reach out to your Customers. Tap the Settings icon and then ’My Personally Enrolled Team’. Once you’ve located your personally enrolled team member, tap on their name to access their profile and post a message to their Activity Feed. Your personally enrolled team member will receive a notification on their Activity Feed letting them know a message is waiting for them to view.